Sully Erna Biography, Discography, Music News on 100 XR - The Net's #1 Rock Station!!! Sully Erna, best known as singer and main songwriter of acclaimed Alternative-Metal band Godsmack, was born in February 7, 1968 and raised in the suburbs of Boston, Massachusetts USA where he began his musical journey as a drummer at the tender age of four. Since then, Erna has reaped a myriad of accolades, including several industry records, three consecutive #1 album on The Billboard 200 with his band. With Godsmack, Erna has sold more than 15 million albums worldwide. He was awarded Rock Artist Of The Year at the Billboard Music Awards and has received four Grammy nominations. 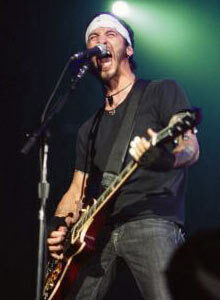 Sully Erna's first solo effort, "Avalon", features an array of eclectic compositions unlike anything he has ever written in the past; a body of work that has taken him over two years to compose, record and finally release, utilizing the hypnotic sounds of tribal rhythms, melodic pianos, cellos and haunting vocals. The disc was released in mid-September 2010 and peaked at #24 on The Billboard Top 200 Albums chart; it contained two singles "Sinner's Prayer" and "Eyes Of A Child".